STARband fixed my son Amari's head, and he enjoyed wearing his unique blue helmet each and every day. Thank you so much, STARband! Our daughter Frances is in her final stage of her helmet but the experience has been great and she loves her helmet. My son got his STARband when he was almost nine months old. He loves his "hat". When we take it off, he looks for it by patting his head and then tries to put it back on himself. He has had such fast progress with it, that he might be able to get it off this week, only three days shy of having it for three months!! When we got the torticollis and plagiocephaly diagnosis, I was devastated! Of course I thought my baby boy was perfect, and hearing he had to wear the helmet was just more than I could handle! However, on November 10th, we received our STARband. My son doesn't know any different, and his head is healing! He was wearing it 24/7, but is now beginning to wear because he's done so well with it. And, we think he's just the cutest, as he's pretty badass in his skull and bones helmet. Our son got his STARband at six months old, and he is now 15 months. It has helped in so many ways with the flat spot and helped with his ears even out. I'm so grateful for his helmet and the outcome! My daughter had to be vacuumed out at birth, leaving her neck muscles tight. She started to about her left side and slowly a flat spot formed. She has been so strong since the day she was born. We were told she didn't benefit from physio because she was above average for her age in mobility and strength. I took her to a chiropractor and cranial therapy but ended up having to get her a helmet. She wore her helmet for only three months but it drastically helped her head shape so fast! Within the first month her CVAI went from a 11.3 to a 7.7. We were shocked! She continued to wear it for two more months and we are beyond happy we made this decision! My son Luke was born July of 2012, he was diagnosed with craniosynostosis when he was three weeks old. We opted for a minimally invasive surgery at Oakland children's hospital in October of 2012. The surgery went great, and he was fitted with a STARband helmet the same month, and kept it on for approximately six months. His head shape is perfect, and we are so blessed to have a happy healthy four year old now. Everyone we worked with in fitting and adjusting his STARband helmet was wonderful and definitely helped us through a difficult time! My son Eli was a big baby who started sleeping through the night early on. We feared letting him sleep on his belly or his side so the result was a pretty flat head. We were desperate to figure out what could be done to help round out his head. Luckily with some research we found STARband and it was the biggest blessing! He is now four years old and his head looks perfect to us. Weston had his STARband for a couple of months. At first I was worried he would not like it. But he loved it! And I did not know my child could look any more cute... and he did!! We had a great experience! My husband and I noticed Logan having a very flat head around two months old. Over the next couple of months, we worked with our doctor to better shape his head. Nothing worked, so we got a referral to visit Shriners Hospital in St Louis, MO. Doctors and nurses at Shriners evaluated Logan. He was in need of a STARband. We made frequent visits to Shriner Hospital from September 2016 to January 2017. Logan went from 106 to a 95 over four months. Our family farms, so my sister in law painted a tractor and farm scene on Logan's helmet. My husband and I are pleased with the results. My husband and I proudly promote our experience. My pregnancy was completely normal, and we had no clue there would be any complications. When it came time for me to be induced, the baby was not descending. I ended up being in labor for two days. Finally, with the help of pitocin, I pushed out my baby boy. The nurses noticed his head shape and a large hemotoma on the back of his head, but attributed it to my long, difficult labor, and thought it would fix itself. Baby Clay ended up having to be in the hospital for five days because the hemotoma caused him to have jaundice. While we were there, the pediatrician came by and said he thought the baby should see a neurologist, as he suspected Craniosynostosis. At two weeks old, we went to Rady Children's in San Diego and met with Dr. Hal Meltzer, who confirmed what the pediatrician suspected. He had us get a CT scan that day to verify, and we did. We soon met with the Plastics team at children's, and surgery was scheduled. At two months and three weeks old, my baby boy was going in for surgery to correct his Sagittal Craniosynostosis. The surgery took about six hours and soon after about 48 hours, he was back to his happy smiling self. A week after surgery, we went to the Hanger clinic to get fitted for his STARband. We listened to our orthotist and memorized our instructions, and followed them to a t. We never had issues that weren't easily corrected. After ten months in the helmet, my baby's head is beyond perfect! We could not be happier! My best advice to new parents experiencing this situation is to listen to the experts and follow their advice. They've done this before, we haven't! We feel so lucky to have been able to be under the care of Dr. Meltzer, Dr. Gossman and Amy at the Hanger Clinic. Evelyn was originally diagnosed with severe torticollis and moderate plagiocephaly at 6 weeks of age. After completing five and a half months of weekly physical therapy visits the therapist referred us to our local Orthotist since the plagiocephaly had moved into the "severe" group. We visited the Orthotist, completed the casting, and within a week we received Evelyn's helmet. It has been the best possible experience we could have hoped for. 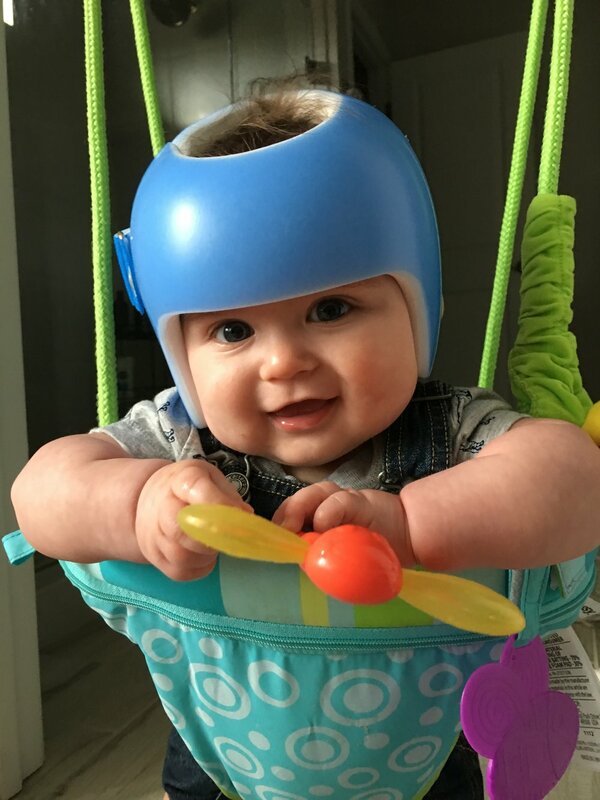 She took to the helmet very well and the plagiocephaly has improved significantly over the last several months. We dealt with an incredible amount of stress and anxiety just hoping that the helmet would work and the process would be quick. It has been just that. These last few months have flown by and we are so thankful that we trusted her Orthotist and stuck to schedule 100%. We could not be happier with our results. Thank you STARband!!! Jacob had to start wearing his helmet at about 10 months old. At his 9 month check up his pediatrician recommended we make a consultation to see if he needed a helmet due to the flatness on the back of his head and how the sides were popping out a bit. Sure enough after meeting with Dr. Brittany Stryker and team at Orthopedic Motion, we found out Jacob's head landed on the 50/50 mark meaning it could possibly correct itself but possibly could not. Not only was his head somewhat flat on the back, popping out on the sides, his head was also pulling to the right causing tension in his little neck. Jacob was already at the age where we needed to make a decision now due to the plates forming in his head. After doing more research it wasn't just a cosmetic fix, this could potentially effect his vision and hearing If not corrected. As any parent you always want what is best for your child. We didn't want to take that chance that it might correct itself so we opted to go with the helmet and so glad we did! We were lucky enough that insurance covered most of the cost as well and from what we hear more and more insurances are. Since the first day Jacob had his helmet on, we never experienced a problem with him wearing it. It's actually cool looking and fits his little personality. So many people compliment his cool skull and cross bones design and chat with us about their child having to wear one or someone they knew who did. It's more common than you think! There are options to spruce the helmet up by getting it painted, decals, or just ordering a design on the helmet. The first week was the biggest adjustment, handling how sweaty the head gets, cleaning the helmet right, putting it on the head right, all the normal questions parents might wonder. But after the first week it becomes natural and part of your daily routine. Also the sweat stops after the first week their head gets adjusted and the holes totally make a difference. Just the smell takes some getting used to :) and they might scratch the back of their head but nothing a good little wash won't fix. Best part is after the first week we could see results. Jacob has had it on 3 weeks now and he his head is at 50% corrected. He will have to wear it 3 more weeks full time (20-22 hours a day) then only when he sleeps! As you can see in our pictures he his a happy little boy, who doesn't mind his helmet at all, plays all day in it, sleeps comfortable and peaceful in it, and goes out and about in it. Despite our unsureness in the beginning of this process, our family is definitely team plagiocephaly/Cranial Remolding and loves the improvement on our baby's head and how healthy he will be when it's over. Shout out to Dr. Brittany Stryker and team at Orthopedic Motion, they are awesome!! !